Need More From Your Business? Next Group Coaching Session Begins August 21st. 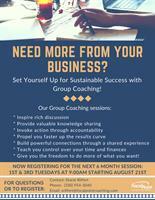 Set Yourself Up for Sustainable Success with a Group Coaching! Give you the freedom to do more of what you want!